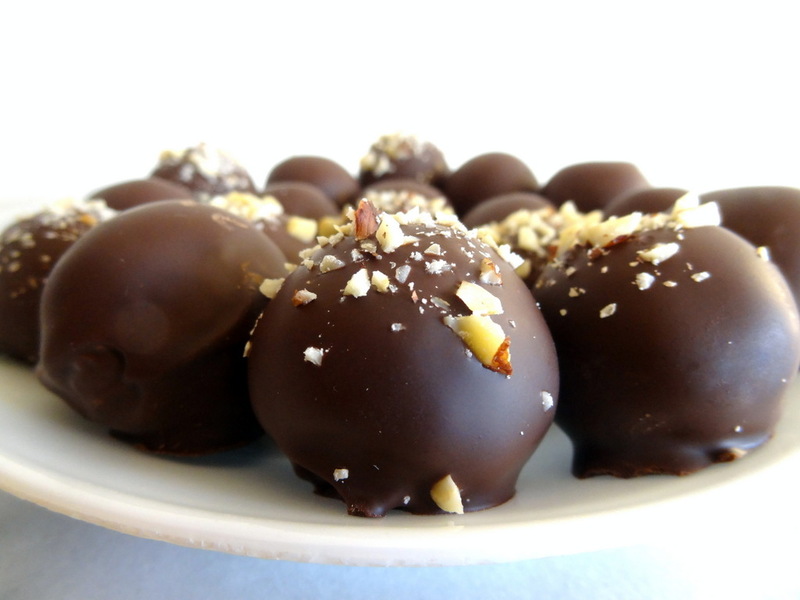 The first time I made truffles was about two and a half years ago. It did not go so well. They tasted fantastic, but it was a rather time-consuming and frustrating experience and only about three of them looked even semi-presentable. The chocolate kept hardening while I was trying to dip the truffles and little pieces of the filling kept breaking as I (ill-advisedly) swirled them around, and to make matters even worse, I placed them on a wire rack to cool, thinking that the excess chocolate could drip off in this way. Unfortunately, I hadn’t really thought that through, and the truffles fused to the rack, making a complete mess when I tried to remove them. Oops. 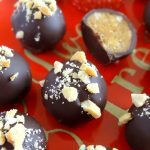 This experience put me off of making truffles for quite some time…until I came across a great truffle-dipping tutorial over at Crazy for Crust – Dorothy’s instructions are awesome and SO easy to follow (thank you thank you thank you)! Thanks to her, I have overcome my fear of making truffles! 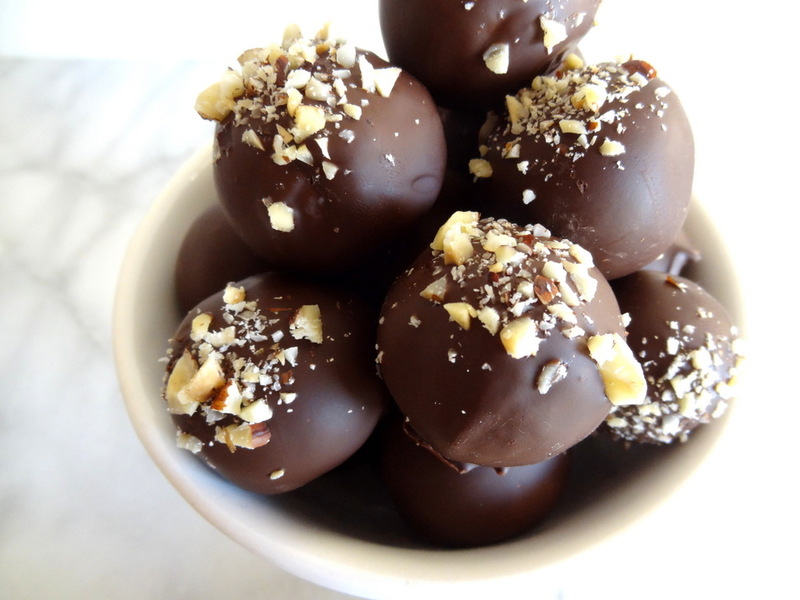 When my boyfriend came over and found a plate of these chocolate hazelnut truffles sitting in the fridge, he exclaimed, “Wow, you made these? !” Nailed it! For real, this time. Preheat the oven to 350 degrees. Place all the hazelnuts (1 3/4 cups total) on a rimmed baking sheet. Bake for about 13 minutes, until fragrant and dark brown. Set aside to cool. Once hazelnuts are cool, rub together in a clean kitchen towel to remove as much of the skins as possible. Place hazelnuts and sugar in a food processor. Process until a paste forms (don’t worry if the paste is still a bit gritty). Melt the chocolate. You can do this in the microwave, or by simmering 1-2 inches of water in a medium saucepan and setting a heat-safe glass bowl with the chocolate on top of the saucepan. Once melted, add butter and whisk until smooth. Whisk in cream and salt; once incorporated, add hazelnut paste to the chocolate mixture and stir until smooth. Place 1 cup roasted hazelnuts (with as much of the skins removed as possible) and chocolate cookies in the food processor. Process until evenly ground. 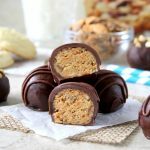 Combine the ground hazelnuts and chocolate cookies with peanut butter and 3/4 – 1 cup of the chocolate hazelnut butter. The amount you need will depend on the consistency of cookies you use – if the mixture seems dry and/or crumbly, add more. Stir together with a fork until combined. Refrigerate the mixture for 30-45 minutes. 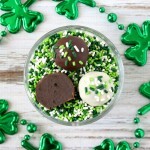 Use a spoon to scoop out 1-2 teaspoon portions of the filling (the amount is up to you, depending on how large or small you’d like the truffles to be) and roll into balls with your palms. 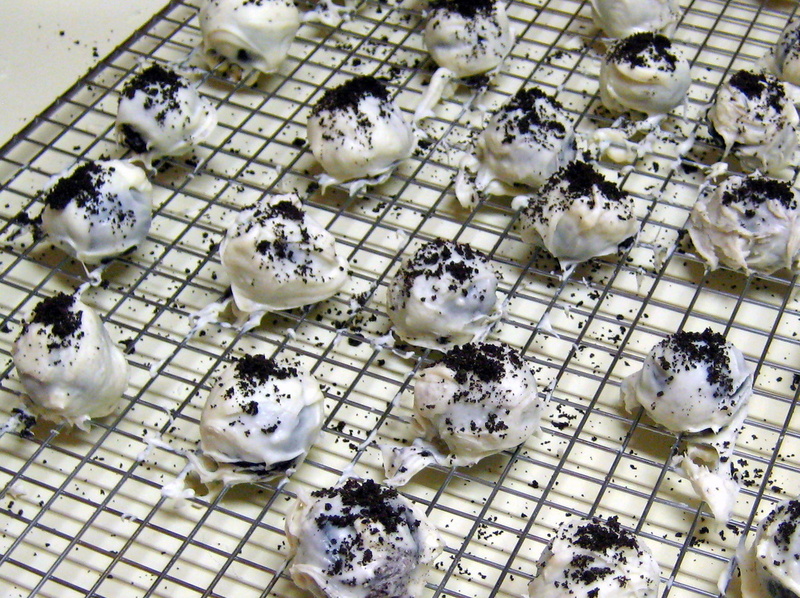 Set rolled balls on a baking sheet lined with parchment paper or a silicone mat. Place the baking sheet(s) in the freezer for 15 minutes. 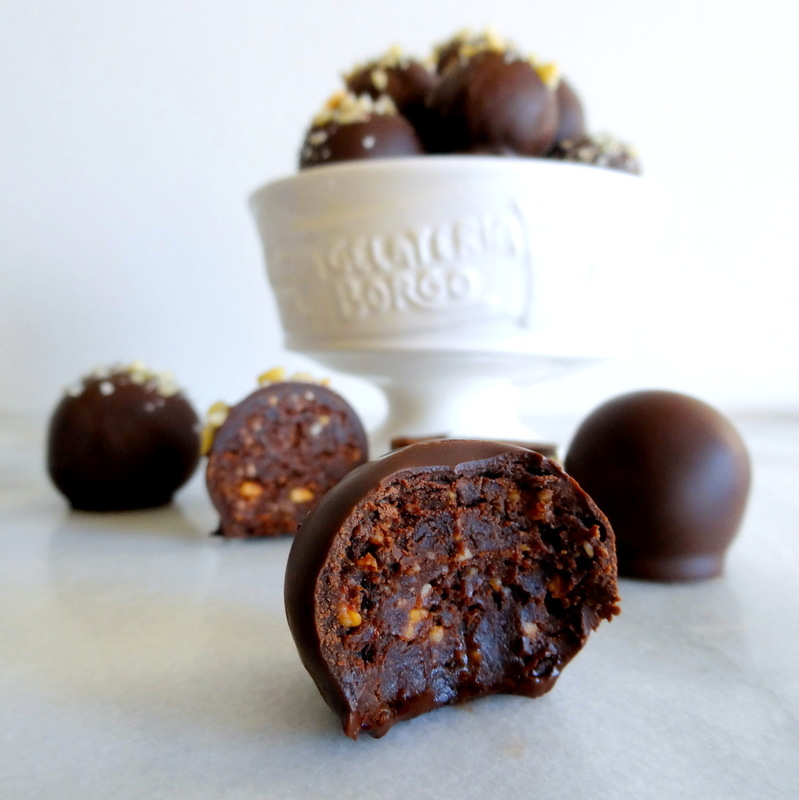 While the truffle filling balls are in the freezer, melt remaining 1 1/2 cups chocolate (mixed with 1 teaspoon oil). I recommend doing this not in the microwave, but by simmering water in a saucepan and placing a heat-proof glass bowl on top. This way, the chocolate will be heated continuously and stay melted as you coat the truffles; if the chocolate is removed from the heat, it will gradually cool and make things much messier and more difficult. To coat truffles, drop each ball individually into the melted chocolate and spoon chocolate over the top (do not swirl the truffle around!). Pick up with a fork and gently tap your fingers against the hand holding the fork to shake off excess chocolate. 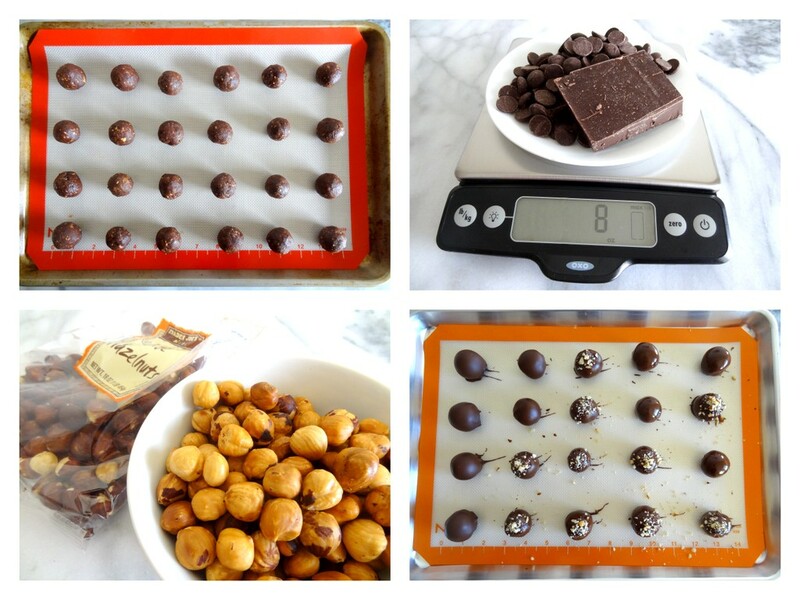 Use a toothpick or cake-tester to slide the truffle onto a baking sheet lined with parchment paper or a silicone mat. Sprinkle with chopped hazelnuts (if desired). 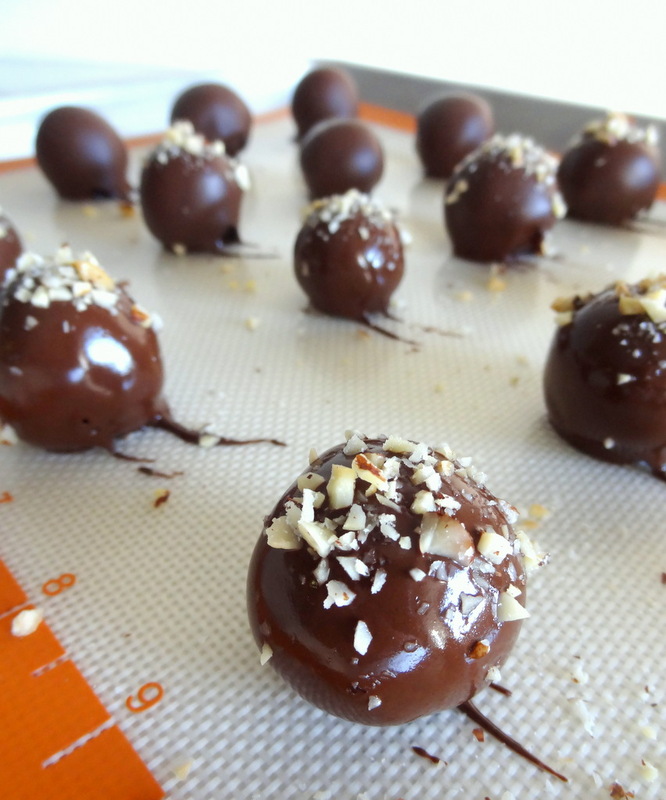 Once all the truffles are coated, refrigerate for 10-15 minutes to allow the chocolate to harden. You can use 3/4-1 cup Nutella in place of making your own chocolate hazelnut butter. 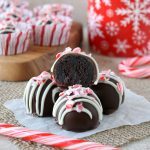 I would have used Nutella when I originally made these truffles, but I didn't have any and I didn’t want to go to the store (thank you, snowthunder and wintry mix!). I had the ingredients on hand to make Bon Appétit's homemade version, so I did. While I was perfectly happy with how it works in the truffles, as a spread, it’s pretty weird. The oil separates out in a highly unappealing fashion and the consistency of the spread itself is nowhere near as smooth as store-bought Nutella. Thanks! I was really happy with how they turned out! hazelnut is the way to my heart sista – NAILED IT. I used to pass over hazelnuts since they’re not my favorite to snack on by themselves, but they’re really quite lovely in baked goods and things! Thanks for stopping by! These look fantastic!! I love hazelnuts. And thanks for the link love! Of course, my pleasure! Thanks for stopping by! Me too – I’m starting to obsess over the endless flavor possibilities! These look beautiful!!! I’m getting major chocolate cravings right now haha. Nice job!! Awesome post. 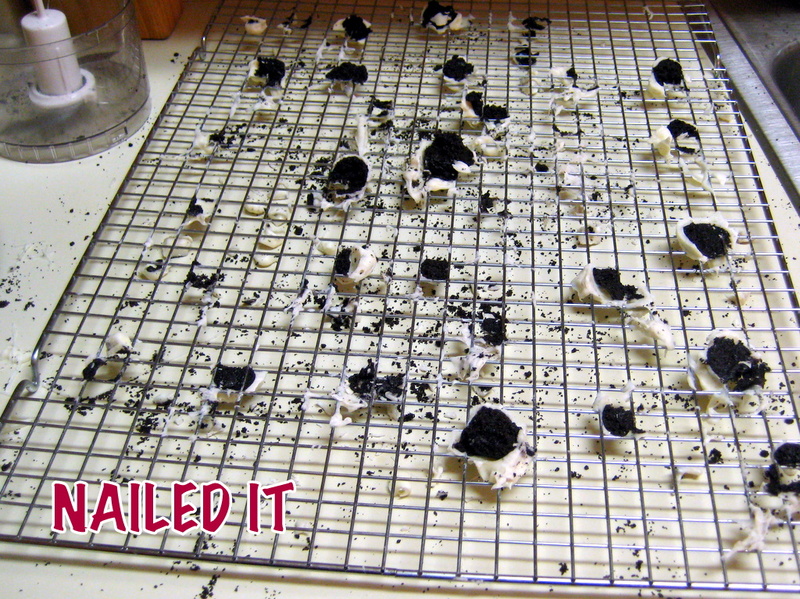 I love to hear/see food failure stories that are followed by food successes! Thanks! Me too – it can be such a bummer to have a recipe fail, so it’s quite refreshing and encouraging to see other people’s flops-turned-successes. Ahh…haha!! I’m the worst truffle maker in the world. But I love them! I think I’m going to give this one a try…it sounds so delicious…and you make it seem so easy! My biggest issue has always been the melting of the chocolate. I’ve never been able to temper it properly…and would love someday to master that. Doesn’t that sound silly? But it’s true… tempering chocolate intimidates me. <3 Awesome post! Well, as you can see, my first attempt at truffle-making was noooot the prettiest – but this method from Crazy for Crust really worked wonders for me! I have to admit, I’m not even sure exactly what “tempering” chocolate means…but I haven’t had problems with the candy setting properly, and I just melt chocolate chips and some oil in a glass bowl over a pot of water, so…good enough for me! Let me know how it goes if you try these!